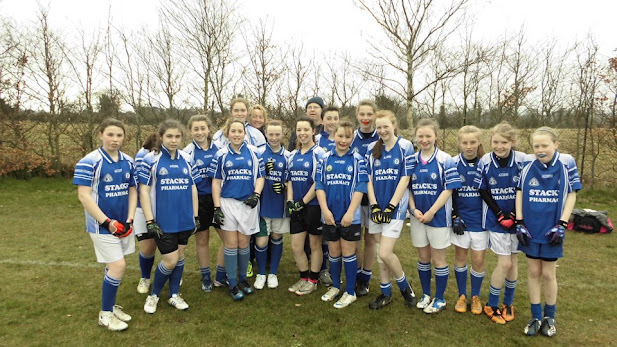 Skerries Harps under 14 girls won out in a hugely exciting encounter with St Finians of Newcastle in the Ballast Pit on Sunday. The match ended 3-06 to 0-04 to the Harps but it was a great display from both teams that hung in the balance until the Skerries girls made sure with a hat trick of goals in the second half. The game began in a gale and heavy rain that favoured the Newcastle girls meaning that the Skerries defense was under pressure from the start. The full back line of Leah Coleman and Michelle Cummins put in some outstanding work during the early exchanges. Goalkeeper Jennifer Daly made some crucial saves too and throughout the game, not least into the strong wind, her powerful and accurate kickouts provided an excellent launchpad for Skerries’ attacks. The Skerries half back line of Hannah Coleman, Leanne Kelly and Katie Norgrove came more and more into the game as the half wore on. Their tackling, blocking and ability to run with the ball into the strong wind meant Skerries finished the half on level terms, 0-2 apiece. From the outset of the second half, Skerries put pressure on Newcastle and started to look the stronger side, despite the fact that the rain had cleared and the wind had dropped to the point that it was no longer an advantage. Siofra Gilmore put in an outstanding display at midfield, as did Annabella Francis and Abby Downing on the half forward line. Kaylagh Bailey and Danielle Tolan in full forward were winning lots of great ball for Skerries and both were awarded with excellent points that saw the Harps move into a slim lead. Rebecca Carron and Emma Halpin were always dangerous in the full forward line, feeding off some great passes from the girls further out the pitch. With the game still in the balance, Éimhín O’Connor made a strong run into Newcastle’s danger zone and banged the ball into the net to give Skerries a commanding lead. Emma Halpin quickly followed up with a goal of her own and then added a third to put the seal on a great, well deserved victory. Tribute must also go to a great Newcastle side who played their part in what was a most entertaining game.